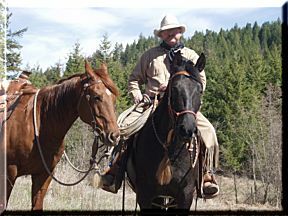 Lexi was originally purchased as a resale project then Kurt started riding her and found they made a wonderful pair. Lexi will be staying as Kurt's companion and trusty steed. 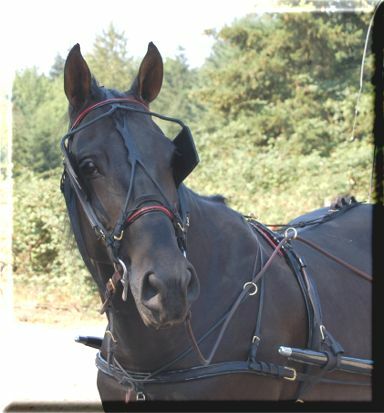 Lexi made her driving debut at the Festival of the Andalusian in August 2006. 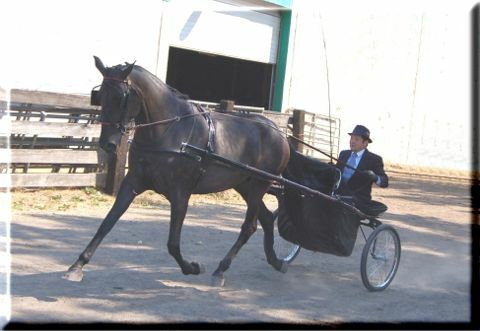 Shown here in the capable hands of our driving trainer, Mike Pereillo, Jr. of Gambit Training. 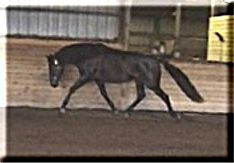 Lexi will be competing in 2007 in breed shows and possibly CDE. 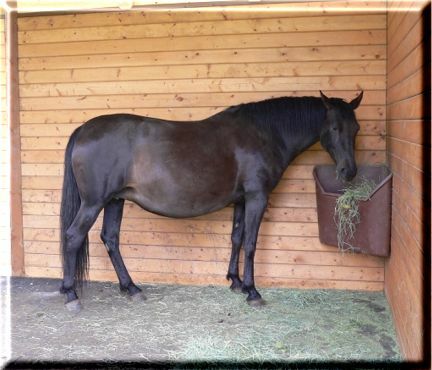 Lexi shown here in April 2005 - only a month from foaling. Lexi shown here with one of her male "attendants". She adores men and will do anything for them for a scratch and a treat. Lexi foaled on May 5, 2004. 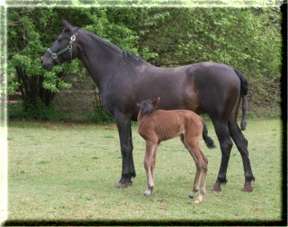 A bay filly by Berraco. 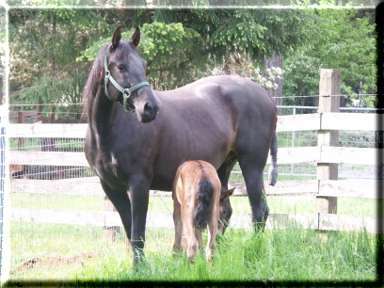 Click here to see the pedigree of Lexi's 2004 foal. Click here to go to Berraco's page. 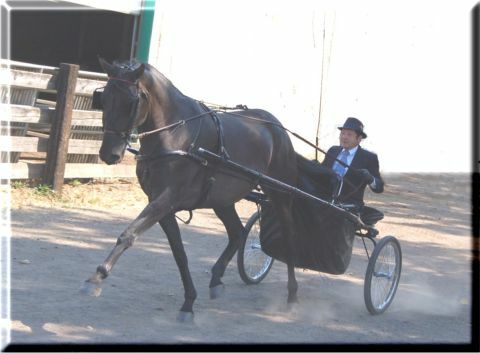 Click here to go to foal's page-Carmen Electra MSM. 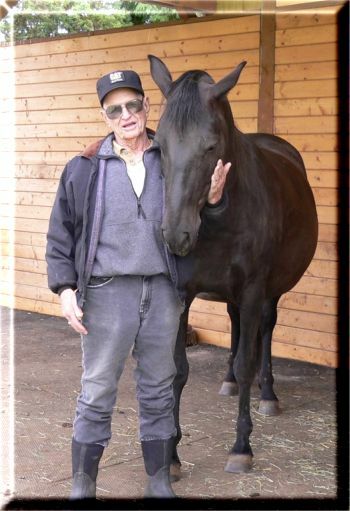 Lexi in the high desert with her friend, Bill Basham. "Lexi" arrived from Urich, Missouri and stepped off the truck like she'd just been on a couple of hours. 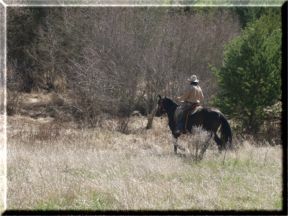 She walked down the drive between two paddocks while horses ran up to greet her and was well behaved. Lexi is 16 hands and has been professionally trained for two years. She already has two National Top 5 titles - Hunt Seat and Western Junior Horse - and has proven herself to be a sound and reliable riding partner. Our beach trip was exhilarating and Lexi loves outdoor adventures. She has become an enjoyable mount for Kurt and she is now "his horse". 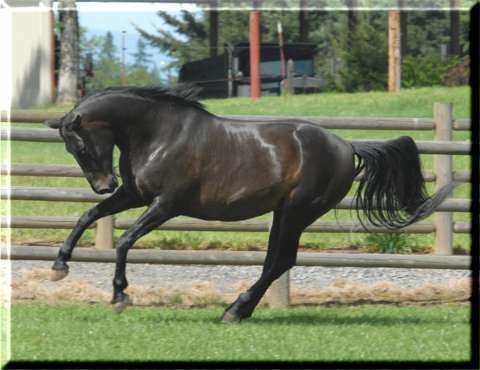 Lexi is a nearly black (black bay) daughter of the National Champion black stallion, Navarre. Her dam carries the lines of Temerario and Caballeroso de Nevasco. She may very well carry a black gene. Her size, temperament and color make her a gem for our breeding program.